So you’ve joined Markeroni and you want to go on snarfari. Excellent! How do you organize your trip? Well, most of us make snarf maps. There’s no one “right” way to make a snarf map, but this is how I make mine. Click on any picture for a larger view. A note on the GPS: if you don’t have one, you can still use this method to put together the map, but unless you’re making a walking tour you’ll have to print out additional directions between destinations. Step One: Pick a place to go. For this example we’ll be visiting Charleston, Illinois, because it’s reasonably small with reasonably few snarfs. Step two: Make a map. Go to Google Maps and click on “My Places.” Then click on “Create New Map”. Name it whatever you want. I usually also check the “unlisted” radio button, but that’s not a huge concern considering this is all publicly available information anyway. Be sure to click “save” though I think Google’s pretty zealous about autosaving. Though it’s entirely populated by volunteers, this is by far the most complete marker database I’ve found online. There are a variety of ways of getting your data from HMdb, but I like to go to the county list and work from there. Charleston is in Coles County, and the first marker on the list happens to be in Charleston, so we’ll check that out. If you scroll down to the section of the marker page titled “Other Nearby Markers,” you’ll see a link for all markers in that town. Now you have a shorter list of just the markers in Charleston, with the option of seeing them all on a single map. Now, you could easily just print this map, go to Charleston, and walk the block it would take to visit these four markers. But this is just an example, so we’ll go my usual route. Trust me, it’s much faster for snarf-rich areas. Anyway, HMdb has a lovely feature: download all the points on the map to a .GPX file. GPS note: .GPX is the common GPS eXchange format, so you may be wondering why I don’t just quit here and upload the file straight to my GPS. And if I were smart, I probably would do exactly that. However, this tutorial isn’t about what I’d do if I were smart; it’s about what I actually do. That, and I enjoy making snarf maps. So I’ll stop now and then to say “hey go ahead and download to your GPS here” whenever the ability is available, but otherwise I’ll just continue on with my usual modus operandi. Okay, so you have a .GPX file called something like HMdb-20110101.gpx. Note: if you’re doing a more snarf-rich area, like, I dunno, Richmond, Virginia, you will have multiple pages of markers. In this case, you look at the first 250 entries on a map, save that GPX file, then go the next page in the list and show those on their own map, and save that GPX file as well. It will save under the same filename, but if you’re using smart equipment it will automatically rename the duplicate files as something along the lines of HMdb-20110101 (1).gpx, HMdb-20110101 (2).gpx, etc. Don’t forget to actually download the .kmz file! Return to Google Maps and load up your new map. Click on “Edit”, then “Import”. A window will pop up. Click on ‘Choose File’ then select the .kmz file you just downloaded. The map will populate itself. Ta da! Unfortunately, you may have noticed that only the text of the marker is included in the waymark description, not the actual location. Right-click on the “Web Link” at the bottom of the description text box (you may have to scroll down) and choose to open the link in a new window or tab. This will bring up the marker’s page on HMdb. I copy whatever useful information there is from the Location paragraph into the waymark description on Google Maps. For me, that’s the GPS coordinates and the nearest intersection and/or address (if available). Since there’s always a photograph, I often note what kind of marker it is: sign, table marker, plaque on rock, etc. That way I know what I’m looking for. I also change everything to plain text because I find HTML formatting obnoxious. Note: If you cannot edit the description or you can’t see something I tell you to click on, always make sure your map is in Edit mode. If it isn’t, there will be an “Edit” button at the top of the left sidebar. When I’m finished, I change the marker color so I know it’s done. This is especially useful when dealing with large areas, since sometimes markers will show up right on top of each other on the map. I click the waymarks on the map to update them, then check the list on the left side to make sure I got everything. Click on the picture of the icon in the description window to change what it looks like. Though the National Register website is pretty good, I have found Wikipedia to be the most useful when it comes to making snarf maps because all the coordinates are in the proper format for Google Maps already. I do a search for “national register [county name] county [state name]”. So in this case I’ll be searching for “national register coles county illinois”. 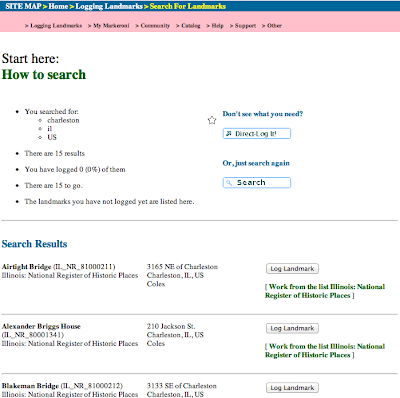 The search results list “National Register of Historic Places listings in Coles County, Illinois” as the very first entry, and this is what we’re looking for. Now go back to Google Maps. GPS note: If you would like to convert your Google Map to a GPS file, visit TakItWithMe. As with the HMdb file, click ‘Import’ and choose the ‘kmlexport’ file. This will populate your map with the National Register locations for Coles County. Everything is labeled with the standard blue waymark flag, which is another reason I like to change the color of the ones I’ve finished. Since the National Register listings are by county, there are a number of waymarks in nearby Mattoon and elsewhere. We only want Charleston, so go ahead and delete all of those. This next part is a little tedious, but it goes quickly. First I like to put ‘(NR)’ in the title of the National Register listings so I know I’m looking for a building or area, as not all NR properties have signs. This is easy: click on one on the list, type (NR) (or ctrl-v if you copied it to your clipboard), and move on to the next one. Clicking inside the title box, selecting “done”, or pressing enter are not required. Once you’ve completed this, go back to the Wikipedia list. Copy the text of the ‘Location’ column into each waymark description so you have the GPS coordinates and, where available, the address. If I am doing a longer snarfari I’ll also include the city, but since these are all in Charleston, I’m not worrying about it. HMdb and National Register comprise the bulk of the historical markers you will find online. However, there are other resources out there. Markeroni is obviously a good place to look, since that’s why we’re doing this in the first place, but if you’re hunting in previously unsnarfed territory, you generally won’t find more than National Register and occasionally state marker lists. Most of those do not include GPS coordinates, and the location information can be tricky to decipher by those unfamiliar with the area. Part of the purpose here (besides the fun of snarfing) is to help expand the Markeroni catalog to aid future Markeroons. In this case, the only markers already in the Markeroni catalog are indeed the National Register listings. Waymarking.com is a sort of GPS game founded by the same people behind Geocaching. Like HMdb, it is entirely user-populated, and I have found that occasionally Waymarking.com members and HMdb.org members find different historical markers. So it’s worth checking out. Since the zip code for central Charleston is 61920, we’ll search using that. The default search radius is 100 miles; I like to narrow this to something more like 10 miles. This reduces the search results from 10 pages to 2, which is small enough for me, but you can also narrow by category if you prefer. Scroll through the list and open up any that look like snarfs, such as state markers and war memorials. Some of the listings will not be snarfs, or will be repeats of what you already have, especially the National Register category. Just ignore these. Also note that gravestones do not count as snarfs on Markeroni. Also, even though we limited our search to within 10 miles of Charleston, some of the listings will be farther out than we feel like traveling on this particular trip. So for this search, I found three markers not listed in HMdb.org or the National Register: Fourth Lincoln-Douglas Debate site, Lincoln-Douglas Debate, and The Charleston Riot. To add an individual waymark to the map, copy the GPS coordinates from the waymark page. Paste these coordinates into the search bar of Google Maps and press Enter. The green arrow marker is the actual location of the coordinates, while the ‘A’ flag is the closest street address Google Maps can find. Sometimes these two markers are quite far from each other, so be sure to click on the green arrow marker. Click ‘Save to Map’ on the menu, and choose your map name in the drop-down box. After you click ‘Save’ a yellow bar will appear at the top of the screen with the option to ‘View Map’. You can either click this or return to your map in the normal way via ‘My Places’. This new waymark will appear with the coordinates listed as both the title and in the description. I usually change the title to the marker name and add location and other information to the description. So now we have a few more stops for our snarfari. GPS Note: If you have a Groundspeak Premium Membership, you can download Waymarking search results and individual sites as a .GPX, .KML, or .LOC file. Most states have their own historical marker programs, but some websites are better than others. The best I’ve found so far is Virginia, but Illinois has a pretty good one as well. Start by hovering over ‘ISHS Markers’ on the left menu and choose ‘Markers by County’ from the list that appears. You’ll come to a list of markers by county. Scroll down to Coles and check out the markers. You may already have some, and others may be too far out of Charleston to be of interest. But there’s a small number of them so it’s worth checking them out. As it turns out, the only ones located within our area of interest are the same two we already found on Waymarking.com, but it’s good to know this resource exists. Several organizations have their own historical marker programs, such as The United Methodist Church, ASME, and the Daughters of the American Revolution. (A quick note on DAR: their markers are erected by state and local chapters, so check with whichever groups are nearest your snarfari location.) None of these organizations have markers in our snarfari area, so we’re done populating our map. You are welcome to stop here and be on your way, of course, but I like to make my snarfing experience as simple as possible. I plan my route and order my marker list accordingly, so rather than puzzling at the map between stops I can just put the next set of coordinates into my GPS and go. Even if the route is completely walkable, I still prefer to have an order to things so I know which marker to be looking for at any given time. This is where my use of Google Maps strays from the ordinary. Though you can easily click on a waymark to see its information when working online, once you print out the map all connection between the map and the list vanishes. Unless you give them different icons. Google Maps provides a large number of icons to choose from, or you can upload your own. There are enough default ones available that I just use those. If you click on the icon in the information window for a waymark, you will be given a large list to choose from. I have decided to start from the southern end and proceed in a sort of bass clef shape. Since I don’t always have access to a color printer, I use only the icons with a distinctive shape. I start with the knife and fork and proceed down the rows from left to right. A friend of mine was disappointed when she realized that the icons themselves are meaningless: she’d expected to see a bathroom conveniently located by a snarf! But no, these are used only because they are unique and easily recognizable on the map so I can plainly see which map icon corresponds to which marker on the list. If two snarfs are close enough that they’ll probably be the same stop, such as the two up by the Coles County fairgrounds, I set them to be the same icon since it doesn’t really matter which order I snarf them in. Next I order the list by dragging and dropping each item. This way I can just run down the list. The map allows me to see which snarfs are where, so if I’m running out of time/daylight/energy, I can see at a glance which markers I’d least mind skipping and which areas are the most snarf-rich. I’ll also probably print out a close-up view of the downtown area, since those may well be a single stop with a short walk. Rather than bringing my GPS along with me, I can just look at the map to see about where everything should be. And don’t worry about the lack of line breaks in the descriptions here – when you print it out, everything looks the way you typed it in. Now it’s time for the real fun: going on snarfari. Be sure your camera’s battery is fully charged, you’ve thoroughly labeled any books you plan to release along the way, and your mascot is ready for its close-up. And most importantly, have fun!